Located directly across from the Tennessee Walking Horse National Celebration Grounds and only 14 miles from Lynchburg, Tennessee, which is home of the Jack Daniels Distillery, the Best Western Celebration Inn & Suites is an exceptional Shelbyville hotel that offers everything visitors need for an unforgettable stay and is the only AAA and CAA-rated hotel in the county. In addition to friendly customer service and comfortable accommodations, the Best Western Celebration Inn & Suites also offers an exceptional location near or just a short drive away from exciting area attractions, including the Jack Daniels Distillery, Middle Tennessee State University, Webb School Fall Craft Show & Sale, RC Cola Festival, Moon Pie Festival, the Tennessee Walking Horse National Celebration Grounds, popular shopping and dining and more. 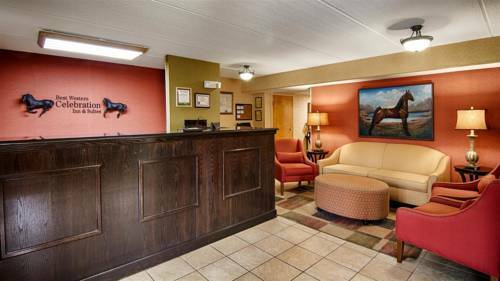 Inside this exceptional Shelbyville, TN hotel, guests will find thoughtful touches and all the comforts of home inside each newly renovated guestroom, each of which comes complete with pillow top mattresses, 32-inch flat screen LCD TVs, a microwave and refrigerator. Other amenities at the Best Western Celebration Inn & Suites also include free high-speed Internet access, complimentary breakfast daily, a heated indoor pool and on-site fitness center. Harley-Davidson guests and pets are also welcome at this Shelbyville hotel. Guests staying at the Best Western Celebration Inn & Suites on business will also appreciate this Shelbyville hotel's close proximity to area businesses - including Tyson , National Pen, Calsonic Kensai and Jostens . Ready for an unforgettable Shelbyville, Tennessee hotel experience? Book a stay online and save with the Best Western Celebration Inn & Suites. We look forward to welcoming you here. Enjoy your stay. Outdoor pool - 1.14 mile(s) from Shelbyville Recreation Center, a full service recreation center offering classes, and indoor and outdoor pool with outdoor water park. Pool - Exercise facility, open from 5:00 a.m. to 11:00 p.m. Conveniently located adjacent to our indoor pool area our fitness center offers our guests everything they need for a good workout. 6.95 mile(s) from Historic Wartrace, home of the Wartrace Music Festival as well as many historic homes and shops. 35.63 mile(s) from Historic Sewanee, a beautiful town which is home to the University of the South. 20.43 mile(s) from Bonnaroo Music Festival, Manchester's Annual Music and Arts Festival normally one weekend in June. 8.95 mile(s) from Historic Bell Buckle, home of numerous artisians, craftsmen, and the famous Bell Buckle Cafe, step back in time strolling Bell Buckle shops as well as the annual Bell Buckle RC Cola & Moon Pie Festival as well as their annual craft show.